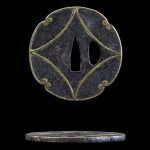 Special feature : On round shape iron tsuba, Chrysanthemum and window design is engraved and inlayed with gold. It is gorgeous tsuba with detail inlay. The openwork is wonderful. The whole layout is nice as well.